(It’s about 2pm on a Thursday afternoon. Andrew is sleeping soundly on the couch, mid-dream. Narration: There, covering the facade, is a huge mass of grey spray paint, outlined and detailed in black. It’s a cartoonish 50ft tall rat extending from foundation to attic peak and side to side. 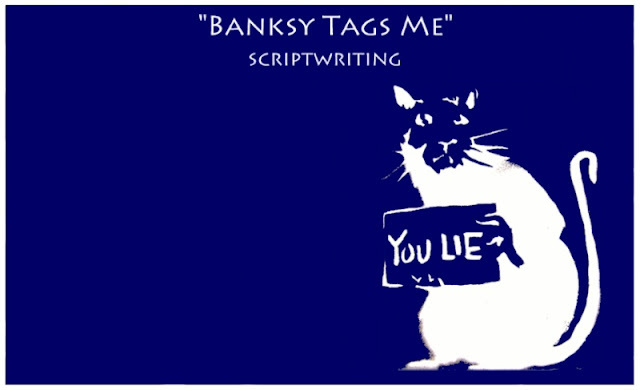 The artist was ballsy enough to tag his name to it... in big bold black lettering... B-A-N-K-S-Y... Banksy. Narration: I stand there limp, gazing up, slack-jawed in disbelief. That familiar buzzing rises in my head, and I feel nauseous. Narration: She’s obviously referring to the home several doors down, the one having a new roof put on.... She hands me her business card and I take it. It states her name as merely Dondi. Narration: Dondi drives off in the crown vic with a city logo on the door reading “serving our citizens”. I watch as she drives to the end of the street and pulls into the parking lot behind the corner laundromat. She sits in a spot there, idling. I turn and look back up at the rat. The buzzing in my brain seems to finely vibrate my skull. I turn again and scan the neighborhood. Down a few houses and across the street are two large men sitting on their front porch. They’re both wearing sunglasses, silent, looking this way. I assume they witnessed the exchange with Dondi. I shrug and smile at them as in “whaddya gonna do... the bureaucrats”. But neither respond, even with the slightest of facial movements. My expression goes slack again. I watch as one of the men takes a long drag off a cigarette. A few beats later, he blows the smoke straight up then faces me again. I shake my head, walk to the side porch and back up into the house. I walk to the front window and open the shade. I pull up a chair and look out onto the neighborhood. The sunglassed men from the porch are now in their car. They pass on their way up the street, slowing down and taking a good look at the front of my home. They can’t see me here, the front windows are tinted with a reflective film. The driver flicks his cigarette, and it lands smoldering on my lawn. As they drive off, the Crown Vic returns. Dondi stops dead in front of the house, lifts her phone at arm’s length out her window, and balances it there... She’s getting some pics of the rat. A glint in my periphery catches my eye and I glance over at the shiny new object standing in the dark corner of the room, and think opportunity and revenge. But those thoughts are never that strong. In fact, they just nauseate me. I think instead of buying paint to cover the graffiti. I turn attention back on Dondi just in time to see her jerk the phone back into the car and put it to her ear. While in phone conversation, she attempts a u-turn, but she can’t make it in one swing, so she backs up, bounces over my curb, and hits my mailbox. It uproots and falls over onto my black-eyed susans. She seems oblivious, distracted in her conversation. She shifts into drive and heads off. Wish I had that on camera. Narration: I look up and watch as a storm front rolls in. I watch as the first few drops of rain dot the window.